Create words to attack monsters and enjoy becoming stronger and stronger. 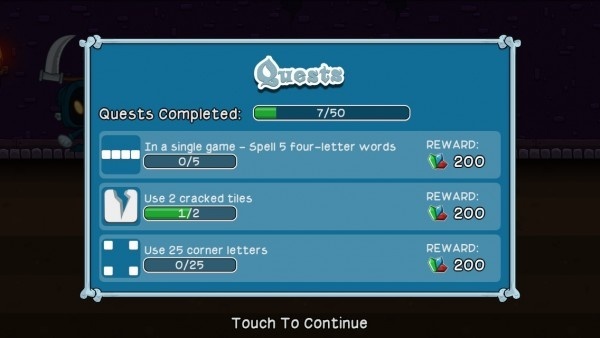 Letter Quest: Grimm's Journey is a title that aims to stick around for a while to come. Encapsulating elements more reminiscent of an Endless Runner (the quests system) and some word game finery, it's a potent mix and terrific fun all round. 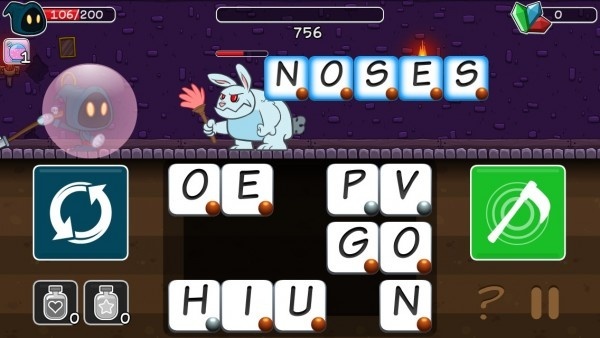 Players control Grimm, the Grim Reaper, as he works his way through stages beating up monsters through the power of words. Never before has the saying "the pen is mightier than the sword" been more true. It's very simple to learn. Movement is done automatically, with players controlling each battle. A grid of letters covers some of the screen, allowing one to create words from them in order to inflict damage. Small words typically cause less damage with words made up of harder to use letters (such as Z, X, and J) inflicting more hurt upon the enemy. Flexibility remains the key buzzword here but there are a few exceptions. For instance, some enemies require a certain number of letters or more to be used in order to inflict damage. Some tiles can become cracked, reducing their point score to zero, others can be afflicted with a plague causing no damage and spreading to other tiles at a dangerous rate. These small occurrences must all be taken into account as one finds themselves up against increasingly stiff competition. Assistance comes in the form of an extensive upgrade system. It's possible to upgrade Grimm's health and other abilities, as well as purchase books to use in conjunction with his other skills. Potions and other aids further add to the arsenal in which one can be boosted. Each of these things cost gems, which can be gained in game as well as through in-app purchases, but it's a fairly forgiving process ensuring that money isn't essential to progression. A series of quests that can be undertaken, and completing certain objectives while playing goes a long way to ensuring it's a smooth and enjoyable process. Pitched so well, Letter Quest: Grimm's Journey is a blast to play. It's easily the kind of game worthy of sticking around on one's iOS device and I certainly found myself keen to return for more. Simple to learn and play for any length of time, there's plenty of longevity and fun to be had here.